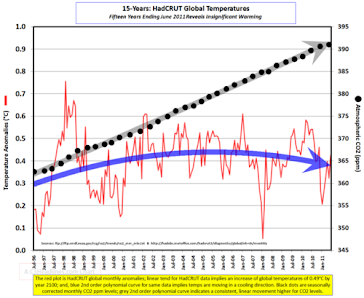 Climate Common Sense: Winds Of Change in the US! 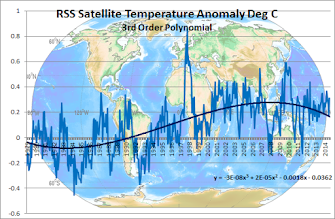 The times are a'changing in the US with a triple whammy for the Warmists in recent polls . The first was the announcement that Rick Perry , an avowed climate sceptic was running for the GOP presidential nomination and he immediately shot to a healthy 11% lead over Mitt Romney in the latest poll. Secondly the GOP has a generic 44% to 37 % lead over the Democrats which would easily give them control of both houses in 2012. And thirdly a generic GOP presidential candidate has a 6% lead over Obama in the Presidential race , all very bad news for Obama and the Democrats. 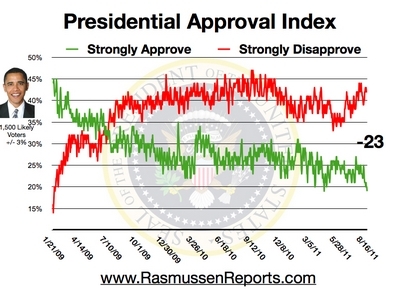 Meanwhile Obama has sunk to a near-record low in the Rasmussen tracking poll. The Rasmussen Reports daily Presidential Tracking Poll for Tuesday shows that 19% of the nation's voters Strongly Approve of the way that Barack Obama is performing his role as president. Forty-two percent (42%) Strongly Disapprove, giving Obama a Presidential Approval Index rating of -23 (see trends).